Blue Sky BuildersSkywriters Garage BlogGable GarageWhich Garage Style Should You Choose? Which Garage Style Should You Choose? Building a new garage or remodeling your preexisting structure can boost your property value and provide your home with some additional curb appeal . As winter finally comes to an end, many homeowners are pursuing their dreams of a perfect garage. With the wide variety of different styles available, there is no better time to check out a new garage, but choosing which style to go with can be challenging. When deciding what type of garage to build, there are a variety of factors to consider. 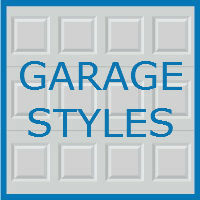 Should you choose a tried a true gable or hip style garage, or unleash your creative side and pursue a custom garage? The possibilities may seem endless, but the specialists at Blue Sky Builders are here to help. What to Consider When Choosing a Garage Style? One door or two doors? When reviewing with a contractor, your answers to these questions will point you in the direction of a garage style that will benefit you the most. Gable garages are a popular choice that feature a roof with two symmetrical slopes that come together above the garage door to form a triangle shape. Gable garages are relatively simple to frame and are often less expensive to build when compared with other options. The slant of the roof can be adjusted during construction to best match the existing style of the home. While gable garages are sturdy, they are not best suited for windier climates, as strong winds could cause them to collapse. The high ceilings of this design allow for additional storage space within the garage, a plus for homeowners hoping for extra storage. Homeowners can choose front-gable, side-gable, or reverse-gable designs, depending on their needs and design choices. A gambrel design is similar to a gable garage, except instead of only one roof section on each side of the garage, gambrel garages have two, making them closely resemble a barn. Also known as “barn style” garages, these structures are better protected against strong wind, and provide greater storage than a gable design. If you are hoping to add a loft or an additional living space to your structure, a gambrel design may be the right choice. Gambrel garages have steep sides, so they are great at handling rain and snow. If you are looking for extra protection from wind and other elements, a hip garage design may be right for you, as this type of garage design offers overhang on all four sides of the structure. Hip garages are extremely common and are economical to build. The roof has four sides that all meet at the top of the garage, so while runoff can leave easily, overhead storage is decreased. This option is affordable, can easily be built to match your home, and with the right touches can boost your property value. Additionally, this design is great for detached garages, as the lower roof will not distract from the view of your home. Looking to add an extra flair to your property? A custom garage can be built based on one of the other design styles, but with add-on items, like a deck or patio. A custom garage can be built to fit your needs, be it additional living space, extra vehicle storage, or an attached outdoor car port. When it comes to a custom garage, be sure to work with specialists that can design and build based around your specific needs. Whatever your garage dreams may be, the specialists at Blue Sky Builders are here to help. From demolishing old structures, to intuitive garage designs, Blue Sky Builders can assist you every step of the way. Check out our garage gallery to see samples of our best work, and call 630-852-8485 or visit Blue Sky Builders online to schedule a free consultation with a garage specialist today.